"Even in the dreamiest Eden is the mundane unearthed; Eden derives its beauty from it." Under the shade of a tree in the cemetery Père Lachaise, in the middle of Summer, the dead stir. Sometimes their cold hands pass over visitors like a sudden cool breeze in the warm, still air. The small chiseled letters affixed to the stone are now barely legible, worn from decades of rot. If you listen long enough, whispers float from all around, and the voices rise like rustling, and the trees pick up and death hands it up from below, this din of unkempt desire and grief. There is nothing more to be said. I've exhausted all avenues. Pushing it further will disintegrate the beautiful fantasy. There are few options left to me. Either I keep going, and watch this house of cards collapse under the weight of reality, or I gather my strength and stay away from you. It's you, ma muse, pushing me to this place today, this high-walled city of tombs. In the summertime, Paris is a bright tribute to fallen glory. I can't tap my cane down the rue without seeing your face, the way it was before the war. Every misshapen street corner and hovel row is a hollow reminder of you, of Lorsque l'espérance vécue. 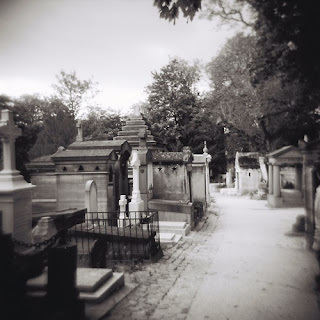 So very near the cemetery, I can see the red, black and pale of you, perched atop the stones. I can't bear the thought of the winters past, our bodies stronger, the streets intact. Do you remember how many nights we handed off glances like delicate charms, muse? Do you remember how our faces grew dour under the weight of forbidden love? I do. I remember how heavy it felt on that last day before the thunder struck, our eyes sunk like the Battleship Gaulois in the Atlantic depths. I wanted to jump from your window and dash myself on the stones below, but I did not think myself worthy of the honor, so I chased death in an entirely different way. I went to war hoping I'd never have to think on it again, on those rose colored nights in your room, of the pain there, but the war only made it worse. Red lights from burning shells warmed my face in the cold dark countryside, my back against a trench. In the arms of death I only saw the red glow from the signs outside your room. How is it that I felt I knew you? Do you remember how we met? If only we had never met. No, ma muse, I could not bear that. I don't recall from where I came. I was a nameless pair of arms hauling on the docks. By night, a ghost rising up with the fog and the gloom, wandering the open parlors and door-less room of Clichy. When I saw you at the window, it was the familiar shape of you that drew me upstairs, to your room. I came every night just to sit and watch you, if just to gaze at you and try to unspool the thread, unlock the puzzle, figure out at last where we had met. I studied the ridges of your brow and the way you lifted your tiny arms and pulled your hair back, the way you tilted your head and frowned when you first saw me. Where had we met? What year? Though a pauper and layabout, I made myself at home with you, and you never turned me away. I took the chair at the far corner of the room and drank cognac and played records and never stopped waiting for the recollections to wash over me. I recall how you laid on your stomach and propped your expressive face between your palms and gazed at me. How you lifted your feet up behind you and wiggled your toes. Your arched eyebrows and broad mouth and knowing eyes shackled me down in your space. The songs from the streets below consumed me, and you'd sing La Liberté for me, your eyes darting up and to the right as you gave me a sly grin and stood up on the bed and danced. I memorized the peeling wallpaper with the post impressionist blocks of color all down the side behind your bed and they became the patterns of my soul. The night came at last that you called for me there to lie down next to you, but transfixed and blinded, I could not. I dwelt near the window still, overwhelmed by a dream I was too weak to wake from. My blindness began there with you, at looking too long at le soleil. Your glowers were of something long past, of an ancient memory of tiny cradles and wrecked futures and visions of red and black and white lights. I could not make sense of any of it, so I stared down out the window instead, trying to slow my heart, out at strings of lights, at sloshing reds and golds and cries of joy and surprise. I half wanted to be there, in the world where I would not yearn so badly. Among the boulevard bourgoise, I could be safe and not consumed by you, but I could not bear to leave your side. Your gazes came at me like arrows, pinning me, even as the lovers came to you. I was but a cold shadow in your corner, the glint of light on a half glass, waiting for bells to peal and miracles to descend. I could not bear to go out into the night and instead stayed. You climbed inside of me, ma muse, without knowing me, without my knowing you, and for that, I sulked in your corner and waited for the world to change. I sipped my brandy and glowered at the others who came in and out. Some of them pulled up a drape, a curtain between us, and I caught the silhouettes of your bodies entwined, your light moaning as they entered you. It might have been an atrophied impulse between my legs, a dead memory, or a carnal fear. Trop de beauté... so I could only watch as they pleasured you again and again. It scraped and stomped at my heart, but I stayed and took solace in the lights outside and I hung onto every gaze from you that I knew was meant for me. I was the one who stayed and made the patterns in the room mine, as you had made them yours, and in that shared experience I thought we'd become a single person there in that red light. Some nights, you were stronger than me. Other nights, I'd own the room and stand and box my own shadow while you performed for the other men. Some nights I puffed out my chest like a boxer and laughed with you and found the deep channels in our discourse and rode them like the black waters of the Seine. Other nights, I was a petulant baby. Brandy soaked and tired of being ignored by you, I'd swing the door open and proclaim my exit. You'd sigh wearily, knowing me as well as you did, and turned your head from a kiss with another man, and laughed loud and long at me. Late one night, just weeks before the war began, your eyes grew smoky and you gazed at me for a long time. I began to speak, but the tightness in my throat grew worse, and you put your finger on your own lips and said shh. Ne parlez pas. Il n'est pas... sage. I apologized and you chided, ne vous excusez pas. Asseyez-vous. "Jeune fou, don't take my permission. Just go... and see you later, okay?" I stomped out down the hall and into the night, kicking my heart between my feet all the way down the Rue until I got home and slunk in despair in my dining room with another glass. Never again, I said. I'm not coming back. Then, I'd see the empty chair in my mind, and the swells of men coming in and out. I'd spend my whole work day on the docks summoning up my courage to come back, to be a better man for you. That night I lumbered up the stairs in the hovel and found the room. You were gone. I sighed and opened the antique cabinet in dim light and poured another, then another. The revelry outside reached a zenith, and the urchins came out and you still were gone. Then the streets were empty and still you were gone. I turned from the window and forced myself to look upon your empty bed and saw the whole of my soul there, laid bare like unkempt sheets. All of Paris mocked my affliction, and my head began to throb with the certainty you were not coming back. In an instant, the seams running over my heart split open. I gathered some papier from the bureau and sat and and wrote you. Staring out that window I'd long loved and loathed, I wrote you. It was my final goodbye, my adieu to desire and need and love. My house of cards, I wrote, collapses under the weight of this reality. Even in the still hours, heart laid bare, you moved past where I could see you. Had I entered this room each night in a hallucinatory reverie, alone? Had I sat in darkness with vermin and silence and the sounds of my own breathing all this time? It would explain so much: how I felt you were such a part of me, even though we had never met. You barely felt real. I took the paper and thrust it into my coat pocket, and strode out into the night through the first door, breathing heavily. Frustrated, unsure, alone. Vous êtes toujours avec moi. Heeding the late hour, I still had only one destination: the conscription office. I shook the doors and demanded to be signed up at once. Even as the horrors on the Western Front unfolded for me and the rest of the cavalerie, they still felt light next to the horrors streaming down my heart. Consumed by self pity and narcissism, I flew into the Western Front like a madman shaking the last stubborn trees in Autumn. I and the rest waited and waited and drank from flasks under beige trees until, in a flash, great heat and light overcame us. Limbs flew, and smoke drifted across miles of waste. The skirmishes danced across pitted scars, and I threw myself across the battlefield as I imagined throwing myself across your bed. The searing bullets grazed my cheeks, then my right thigh, and they were your kisses there, your arms enfolding me at last. I laid with you, in the blood soaked earth, caressing unexploded shells nestled there, feeling the curls of barbed wire as they entwined with me. I felt your legs and arms crossing over mine, and I wept there in the dust and the dark, for some sign that I would see you again. They carried me, ma muse, on stretchers back across the plains, under trees, places where the shells had not pounded the earth so ferociously. An infirmière tended to me, in red and black cloak, and the palest eyes. I reached out for her hand and she stood and it was not you. The war ended and you ended with it at last.